Hello everyone! Grace here hosting for Haibun Monday! In my part of the world, it is the summer season. How do you celebrate your summer? Do you go out for a road trip, have picnics in the park, or go swimming or playing in the water park, or have barbeque & cool drinks? We all like to keep cool with the summer heat. Woe to us if our AC is not working in the house or there is brown out at night! Growing up, my favorite summer treat is halo-halo. This is a Filipino mixed tropical fruit dessert, with milk flavored shaved ice, topped with purple yam, leche flan and ice-cream. There are different variations, but always with the shaved ice to beat the heat. What is your favorite summer treat? Our theme for this week’s haibun is summer! Share with us a summer memory – from a summer love to coping up with the summer heat. Or how about a summer comedy, tragedy or disaster? Being that this is Haibun Monday, please write a haibun based on the prompt, with 1 to 2 tight paragraphs, ending with a seasonal haiku. Don’t forget to visit and comment on others poetry, especially to those who have visited you. Happy Haibun Monday everyone! It is summer here with some thunderstorms, yikes. Anyway, there are loads of cool drinks and ice cream at the bar for you to enjoy. Hope you are having a good day or night ! I’m still writing mine… happy Monday everyone. This is the last week before our summer break, so please keep in mind to give it your best. Happy Haibun Monday, Grace and Bjorn! And to everyone else, of course! Those halo-halos look scrumptious, Grace – well, what I can see of them. Since starting the exam marking I have contracted an eye infection. The doctor isn’t sure whether it’s been exacerbated by the close screen work or is a result of it. Either way, the mediation is ointment, which is horrible as it stings and blurs my sight. So I’ll be posting but not doing much reading today. I just hope it improves soon. I am, however, looking forward to reading as much as possible – can’t wait to see the range of haibun! Yikes on the eye infection Kim. Hope it improves soon as it can be annoying. Take a rest and leave the reading to us Kim. Oh no…..take care of yourself, Kim. Not to worry about the reading…I was just finishing reading from our Thursday prompt today! Oh I know how much your eyesight means.. take good care and rest your sight. Hello everyone. I wasn’t going to write to this lovely prompt but then, I decided to. My favorite summer treat is anything that is cold and light! Hi Toni! Yes that suits me too – cold and light! Hi Lillian ~ I had some ice cream myself after my lunch ~ Hope its not too hot in your part of the world. Right now, its alternating hot and thunderstorms here. Thanks for hosting Grace. I’m still jet lagged and discombobulated but managed a poem. I will be off to the dental office and will be back by dinner time. Hope to see more haibun linked up by then. Feel free to grab some ice cream treats in our fridge, smiles! Thank you for joining us Sumana! Oh, my, that looks and sounds delicious! My mouth is watering! I feel like having only ice-cream or cold drinks all summer long. Lots of ice coming up Sarah! Sangria with lots of frozen fruit is delicious ~ Cheers to summer Jilly! I like this prompt! I’m afraid I went contemporary with it. Maybe after a few I’ll get nostalgic and write a better one. Barkeep, I believe I’ll have a Summer Shade! summer and a weeks rain in a day – Been on the Pina Coladas this week but it was other things that took time from my haibun but have persevered no matter how late! So–late to the party. It’s been a busy few weeks. I’m enjoying everyone’s treats. I’d love a glass of Sangria, and then perhaps try one of Grace’s treats! Arriving late to one of my favorite prompts. Thanks for hosting, Grace. 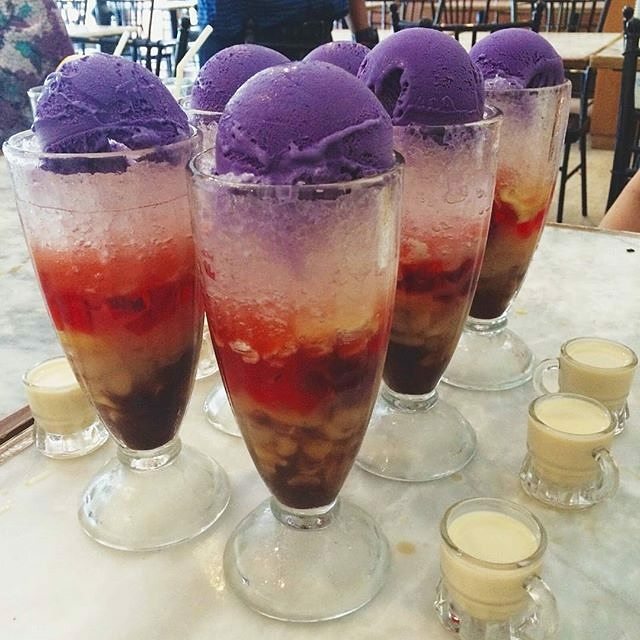 I would love one of those gorgeous-looking halo-halo’s, if you please. My favorite summer treat is pretty simple: fruit that is allowed to ripen on the tree. Something hard to find these days unless you grow it yourself.